This is one of my junior kindergarteners. She has created a Rapunzel costume for herself out of scarves, a blanket, some cloth and some clothespins from the dramatic play centre. If you follow the scarf in her hand, you’ll see she clipped it to another scarf, which is in turn clipped to her glasses. That’s her hair. She’s made a two layer skirt out of some blue cloth that you can see peeking out in front, and the green blanket. You can’t quite tell from the picture, but she is also wearing safety goggles because she was about to start building Rapunzel’s tower. Shortly after this we took a trip to the school library to grab a book about Rapunzel. 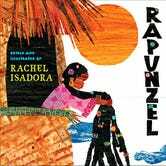 I was planning to get Paul O Zelinsky’s version, due to his Caldecott winning illustrations, but then I also saw Rachel Isadora’s version on the stacks, so we grabbed that, too. Other kids started wanting to dress up too, declaring themselves the witch or the prince, etc in the story. Monday, we’ll get them to caption the photos of what they were doing.